Noradjuha is a rural village in the Wimmera region, 25 km south-west of Horsham. Its main neighbour is Natimuk, 10 km to the north, to which it has been connected by railway as well as by road. It is thought that the name was derived from an Aboriginal word describing the wind. Settlement on farms, as distinct from pastoral runs, began in the Natimuk district in the early 1870s, and probably followed the Natimuk Creek which describes an arc upstream, intersecting with Noradjuha. In 1877 a school was opened, and in 1887 a railway line was constructed from Horsham, running through East Natimuk and southwards to Noradjuha. In the following year the Natimuk district became Arapiles shire by severance from Wimmera shire, and Noradjuha was chosen as the shire's administrative centre over the more populous Natimuk. Possibly the railway connection influenced the choice, as the line was not extended westwards to Natimuk (and Goroke) until 1894. A mechanics' institute hall was used until a shire hall was built in 1889. 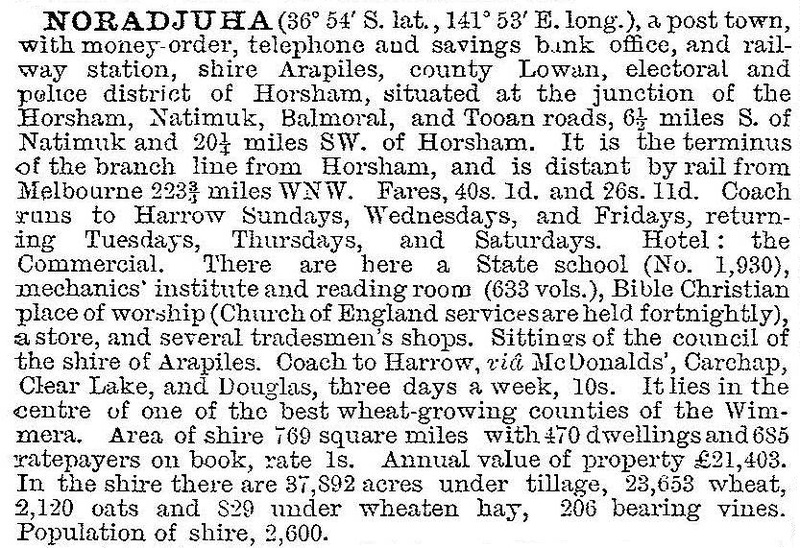 Noradjuha also had a post office and a hotel. The absence of a Lutheran church, unlike Natimuk and Vectis, is noteworthy. During 1912-20 the railway line was extended south from Noradjuha to Hamilton. There was a wheat storage facility at the railway station, but the line was probably under-used for most of its life. It was closed in 1979, when lack of maintenance had reduced its safe running speed to 30 km per hour. The mechanics' institute hall (1886) was replaced by a memorial hall in 1953. For several decades the Arapiles council debated moving the shire offices to Natimuk, which finally happened in 1952 when the building was moved on a lowloader. The hotel, which burnt down in 1928, was not replaced. The school, however, continued through those years until a government closures program brought it to an end in 1996.